Augment your full-time staff without adding headcount to your organization. This option is ideal when someone needs to hit the ground running for flexible lengths of time. Clients often choose to convert from temporary to full-time employment allowing an introductory period before bringing employees on their payroll. We handle all the benefits, payroll taxes and cost of employment to quickly facilitate high quality hires for a flexible time frame with the option to hire permanently at any time. On a Partnered, Engaged, or Contingent Search basis, we find, screen and present a shortlist of candidates for the permanent position you wish to fill. We research, identify, recruit and present exceptional talent to you. 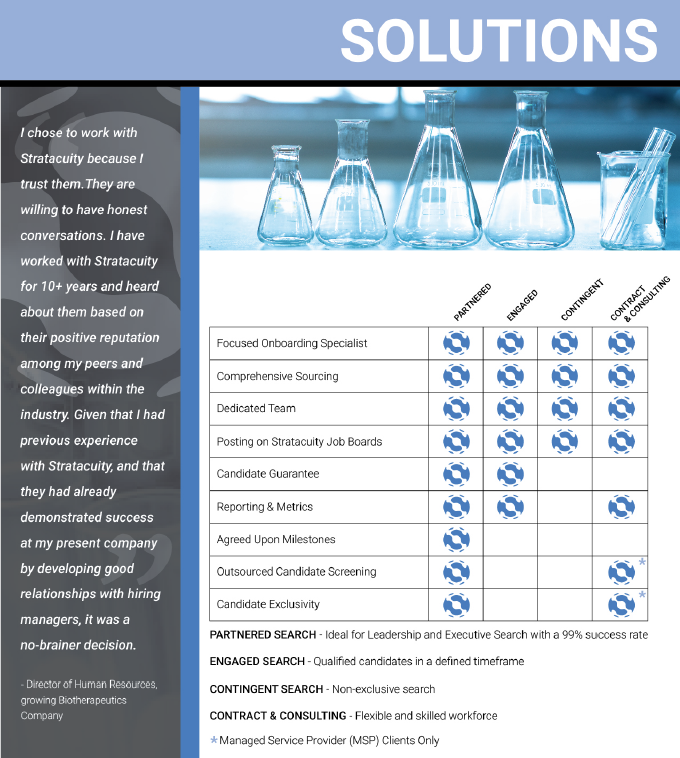 Instead of passively collecting resumes, we proactively contact, assess and recruit candidates with established scientific careers and top reputations. Focusing within specific market niches gives us a depth of contacts and credibility to help you attract and hire the best. Find out why clients trust us to handle all contingent workforce hires. With a deep pool of exceptional talent and a broad range of expertise that allows us to secure talent for every group in your company, we can manage the hiring process, create continuity, lower your cost and mitigate risk as you build your team. We seamlessly integrate with your systems to payroll temporary employees. With a high level of personal care and attention to detail, you can be assured an enjoyable and error free experience.